At the Penn State Relays this past weekend, junior Ashlyn Llerandi set a school record in the pole vault and qualified for the Big East championship meet. Also, Sarah Morrison won the mile in 5:10.39, establishing a new meet record. Big East qualifying standards were achieved on the men's side by Nicoy Hines and Stefan Goodridge (60 hurdles), Chris Kearney (500 meters), Curran Darling (HJ), and Robert Sainvil (TJ). For the women, Sherika Ward (60 hurdles) Ashlyn Llerandi (PV), and Ariann Neutts (1000 meters) all posted Big East qualifying times. Neutts was the first collegiate finisher at 1000, trailing by 1 second only ex-Villanova star Frances Koons, who ran unattched. Among other performances, Oakton, Virginia's Joe LoRusso won the mile, finishing in 4:22.16. 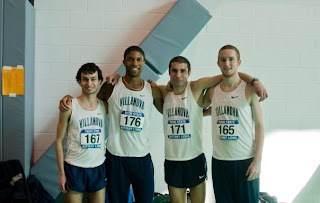 LoRusso also ran the opening leg in Villanova's 4 x Mile victory (in 16:47.83) with Chris Williams, Bobby Papazian, and Dan Lewis (all pictured above). Matt Wickler won the 1000 in 2:30.09 in a 1-2-3 Villanova sweep. Next up for the team is a meet at the Armory in New York on January 16.